Daniel H. Peterson. The Looking-Glass: Being a True Report and Narrative of the Life, Travels, and Labors of the Rev. Daniel H. Peterson, a Colored Clergyman; Embracing a Period of Time from the Year 1812 to 1854, and Including His Visit to Western Africa. The Looking-Glass: Being a True Report and Narrative of the Life, Travels, and Labors of the Rev. Daniel H. Peterson, a Colored Clergyman; Embracing a Period of Time from the Year 1812 to 1854, and Including His Visit to Western Africa. 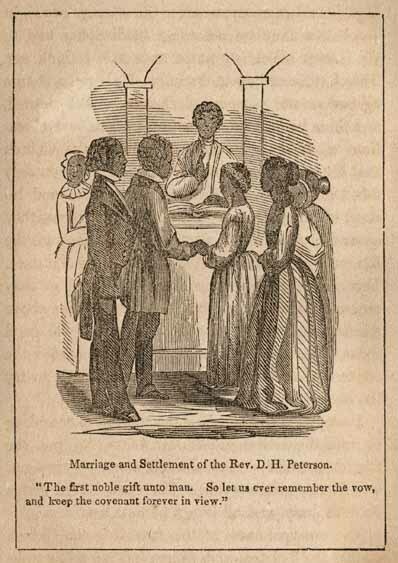 Marriage and Settlement of the Rev. D. H. Peterson. "The first noble gift unto man. So let us ever remember the vow, and keep the covenant forever in view."